Young adults dressed in lab coats using over-sized thermometers to find heat islands in their neighborhoods? A two-foot nose, sculpted to make the process of measuring air quality more visible to community members? These are but two of many projects undertaken last year by Shadelab, a unique, community design leadership program in which talented young Chicago adults gather the data and stories that help community leaders, designers, and city officials make better decisions about how they can improve the health, well-being and efficiency of their neighborhoods through design. Last year we designed and developed this unique program model for Landon Bone Baker, a small Chicago firm, well-regarded for its affordable housing work in under-served neighborhoods. Our group of young interns were hired not because the firm wanted to create a youth program, but because the 16-26 year olds could actually do things the firm couldn’t–acting as cultural translators, building high-tech environmental sensors and gathering data about a place the young adults know better than anyone else: their neighborhood. Shadelab is notable because of the way it redefines how and where learning occurs; the roles young adults play in positively changing the places they live; the manner in which a design firm incorporates youth and community into its creative process; and how we address complex issues in our most needy places. We couldn’t be more excited to say that Landon Bone Baker decided earlier this year to grow this program and make it a truly integral part of the way the firm works. 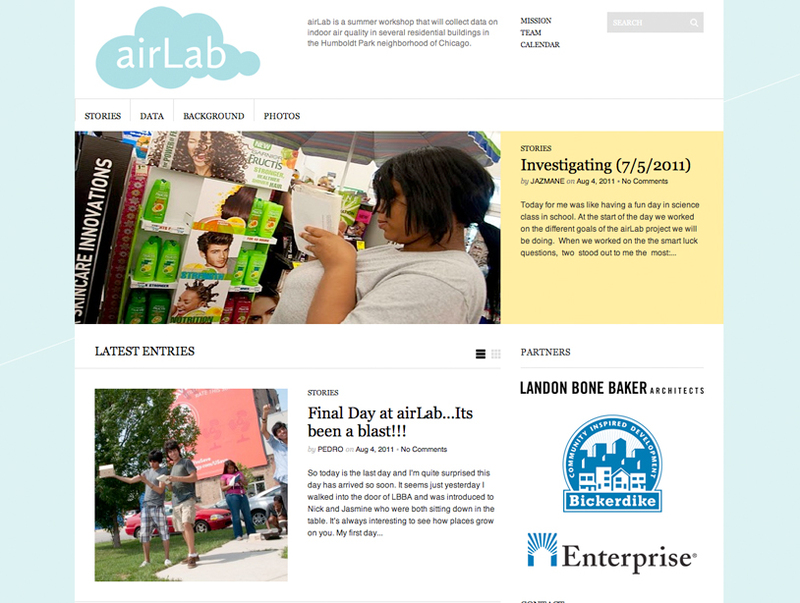 Working in partnership with Bickerdike Redevelopment Corporation and the Chicago Public School System, this summer they launched Airlab. Co-led by Public Workshop‘s superstar former intern Brenda, a staff member at Landon Bone Baker, and Daniel Splaingard (a Rose Fellow at Bickerdike and CAF/Public Workshop Teaching Fellow), the program seeks to evaluate the current air quality and the impact on its residents in a number of Bickerdike Buildings designed by Landon Bone Baker. Folks, we had no direct role in Airlab and yet we are absolutely over-the-moon. Shadelab/Airlab is well on its way to becoming an integrated, sustainable part of how the firm and its community partners works, and there is simply no precedent for this model anywhere. Furthermore, Brenda continues to grow and shine as a leader, and people like Daniel Splaingard are growing into the talented design-educator-leaders that are necessary for this programming to expand, and accomplish great things. And let’s not forget, that Landon Bone Baker, Bickerdike and the Chicago Public School (CPS) system are supporting and embracing this incredibly adventuresome program in the midst of terrible budget cuts. Amazing. With the final day of the Airlab summer workshop wrapping up last Friday, we think congratulations are in order for Landon Bone Baker, Bickerdike, CPS, Daniel and Brenda. The incredible response to the Shadelab and Brenda’s presentation at a national conference on community design. A national award we won for the project.